Good gas mileage, easy to get around and park in town. The vehicle is very well built and therefore dependable. It is roomy and capable of carrying a large load both in the trunk area as well as on top. As with most vehicles repairs tend to be expensive. Since my vehicle is 12 years old at this point, most of the interior could be replaced in order for it to look as well as it runs. That would include floor carpeting, all seat covers and the area around the stick shift. I have priced out the cost of doing such and it would be cheaper to just turn the vehicle in rather than upgrade the inside. Subaru has done a good job of supporting and standing behind repairs that are done or necessary. Like many Subaru owners, I find many positive attributes about the vehicle manufacturer. First, the all-wheel drive is a must. Living in Colorado, the weather changes often and an all-wheel drive vehicle provides greater safety. I also enjoy the space in the vehicle. Despite only being a hatchback, there is ample amount of room for my passengers and myself. Lastly, I'd say that the longevity of previously owned Subarus and number of them on the road is another positive. The vehicle drives forever! Great drive and amazing MPG for an everyday car. Lasts very long! I drive a 2006 Subaru Impreza. It is a great small car that is perfect for someone who is doing a lot of driving but doesn't need a lot of passenger space. The care can hold five people total and the trunk space is average. The gas mileage is very good; I can get up to 20 mpg depending on how much I drive. It is an older car with almost 120,000miles on it but it is still running great! 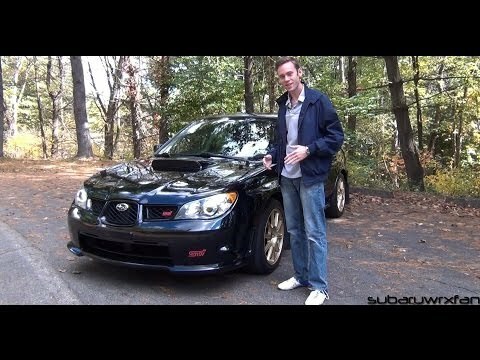 2006 Hawkeye Subaru STI Review!